Since 2003 Polar View and its predecessor, Northern View, have been providing Earth observation services to a wide variety of end users all over the planet. These services include everything from ice charts to help ships navigate in polar waters to monitoring melting snow and glaciers to improve meltwater runoff prediction for hydrological services. Supported under the GMES programme by the European Space Agency and the European Commission, along with the participation of the Canadian Space Agency, Polar View is a conglomerate of various companies, government agencies and research institutes across Europe and Canada. The conglomerate hopes to eventually become an independent, self-sustaining enterprise providing a "one-stop-shop" for information about the cryosphere and the Polar Regions. How has Polar View contributed to the recent International Polar Year (IPY)? Polar View itself was recognized as an official IPY project early on in its own right, and we've made plenty of contributions. I think our biggest contribution has been the creation of the IIPY Ice Logistics Portal in cooperation with JCOMM 's Expert Team on Sea Ice and the International Ice Charting Working Group (IICWG) at the National Snow and Ice Data Center (NSIDC). Before Polar View came along, ice charts were published separately by a variety of national ice services. Any end user interested in sea ice information and sea ice charts for a given area would have to go to a number of different ice services to get all the necessary information they needed. However this required knowing which ice service covered which areas beforehand. 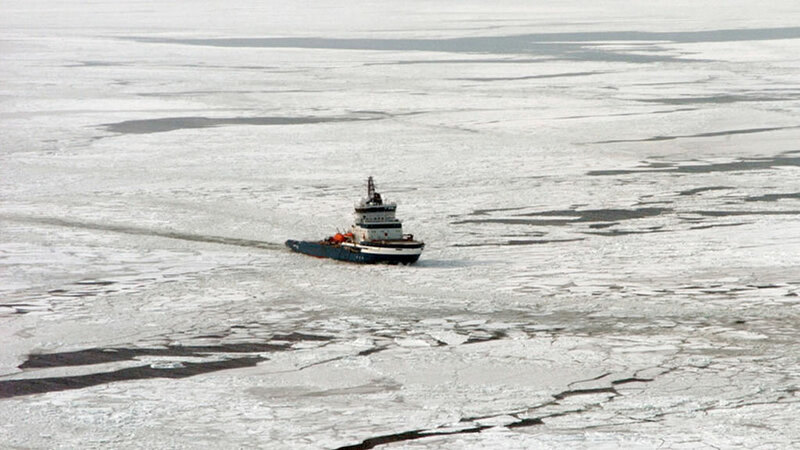 So Polar View was able to bring a certain level of integration to all the world's sea ice services, making it easier for users to access sea ice information. We created this portal, which effectively divides up the world's seas geographically, and then all of the sea ice products generated by any of our participating sea ice services end up being posted on the portal. We don't change the data at all; it's the same data that exists directly through each of the conventional channels. The only difference is that all sea ice-related information is posted in one place to make it more convenient for users to access and to easily switch between coverage areas when travelling by ship for example. In the spirit of the IPY, the portal has been made available to the public. We don't keep a record of who's been using it, but we do keep tabs on the number of downloads there have been. Since the Ice Logistics Portal was set up in May of 2007, there have been more than 100,000 data downloads from the portal, and the number of downloads has grown exponentially. What about other projects Polar View has been involved with? In November 2007 the International Centre for Reindeer Husbandry (ICR) in Kautokeino, Norway became an important partner of Polar View under the IPY EALÀT project (n°399). The EALÀT project is studying how climate change is affecting snow cover and reindeer habitats in northern Scandinavia where the SÀmi practice reindeer husbandry. In this part of the world variations in snow and ice cover can have a major impact on how much food is available for reindeer to eat. So the ICR was very interested in getting up-to-date and accurate information on such things as snow cover and the change of snow cover over years and between seasons in order to better understand the effects snow cover can have on reindeer habitats and feeding grounds in northern Scandinavia. There has also been dialogue on what other kinds of needs exist for reindeer herders and what other kinds of services Polar View could provide them, so we're looking forward to continuing this partnership as the EALÀT project continues over the next few years. As you're aware, the North is a vast area with very few people living in it, so it's important to work with key user groups like reindeer herders to make sure we're giving the best possible benefits to them, not to mention other stakeholders who are concerned with environmental monitoring, resource management, sustainable land use and other Northern issues. Has Polar View been able to make any other key partnerships? All of Polar View's end users are important. A few of them are naturally more prominent, largely because they have a function that goes well beyond the immediate region where they're located and are able to speak about more than their immediate interests, and those are some of the end users we invite to workshops and send to important meetings as representatives of Polar View. The ICR, which speaks on behalf of reindeer herders from all over northern Europe and northern Russia, is a good example of this. But I would say on the whole we have established extremely good relationships with all of our end users. Where do you see Polar View heading in the next few years? We're currently working on moving Polar View beyond simply being an ESA project and giving Polar View its own legal status in a way. We hope to have the organization incorporated somewhere in some shape or form in the not too distant future, which would make it possible to open up other funding possibilities and allow Polar View to be in a position where we can act and speak as our own independent organization as opposed to merely as a project. Has Polar View lived up to initial expectations? I think Polar has lived up to and exceeded its expectations. We've received nothing but excellent feedback from ESA and our end users. We have certainly come a long way from the first proposal that we made back in 2003. The fact that we're trying to make Polar View a more permanent and self-sustaining organization was not something that was envisioned at the very beginning, so I definitely think that right now we're at a place we were never expecting to be. Are there any other areas of Earth observation that you have not investigated so far that you'd like to investigate? Earth observation will always be a key tool simply because collecting observations and data in any other way is frequently inefficient and to costly. However we don't want to limit ourselves to Earth observation. There are other sources of data and sources of information that could be integrated with Earth observation data in order to better meet the needs of our end users. The information people need does not consist of isolated things like a single snow map, a single glacier map, or a single sea ice chart. More often they have more complex needs requiring a variety of information, which includes land use, information about populations, about habitats and about trends, all of which needs to be taken into account when decisions are being made about Northern areas and the Antarctic. This may ultimately include other things such as in-situ observations and other sources of data. So far we've been constrained by the fact that Polar View is a project funded under a specific funding umbrella, and due to these limitations, there has been a necessity to streamline what we do so there's no perceived overlap with other activities also receiving funding under a similar funding scheme. Polar View has always had the ambition to become a one-stop shop for a wide range of polar and cryosphere-related information. We might not generate all of that information, but in the same vein as the IPY Ice Logistics Portal, Polar View may very well become a convenient node through which various users can easily access the different kinds of information they need. Fine-tuning this will be part of Polar View's workload in the next few years. The key thing for Polar View to do right now is continue in the same direction that we've been going and make sure that we remain in tune with the requirements of users. There are plenty of needs out there that remain to be addressed and we certainly will strive to meet these in the future. However right now what we're doing is not dictated by the requirements of users so much as limits to funding, so becoming our own entity will be key in reaching this goal.